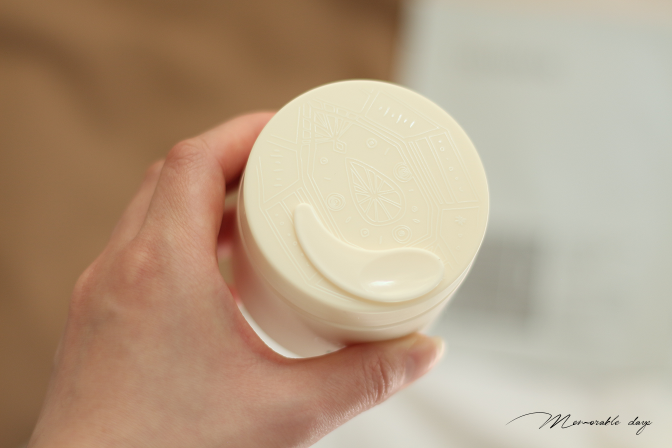 Review: Cremorlab Fresh Water Gel | Memorable Days : Beauty Blog - Korean Beauty, European, American Product Reviews. 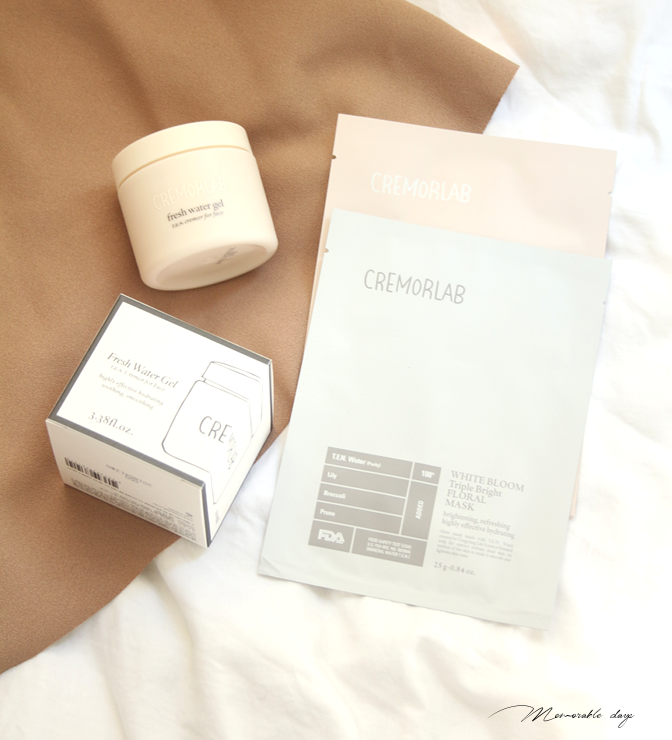 Have you heard of the Korean brand Cremorlab? Today I am going to review the Fresh Water Gel of this brand. The first time that I heard of this brand was in one of Michelle Phan's favorites video and I was interested since. I recently saw it on Honeysu's instagram, which is a brand new webstore in Belgium that sells Korean beauty and they offered it to me to give it a try. This is the first time I am trying anything from this brand, so I was curious! Check out today's review and read my thoughts about it. 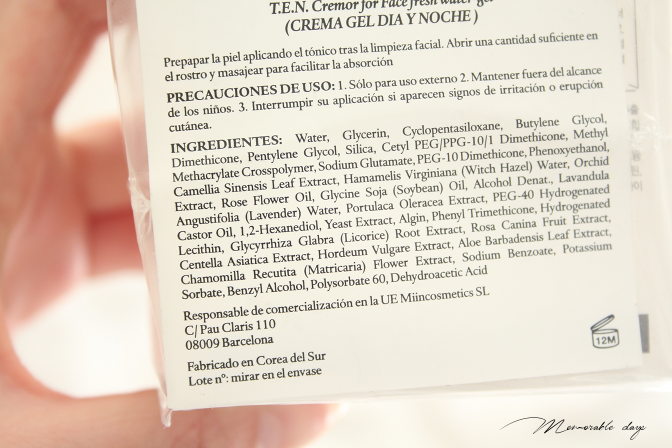 yes, they also offer sheet masks from Cremorlab! Cremorlab’s skincare products harness the power of Thermal water therapy, Eco-energy, and Natural nourishment (T.E.N.). This thermal water is pretty rare and is a mineral-rich water from Geumjin, a region in Korea. Cremorlab's products all contains T.E.N. and it focusses on hydration of the skin. The Cremorlab Fresh Water Gel is a light moisturiser that contains, minerals, natural botanical ingredients, and seaweed extracts rich in Vitamin A, C, B1 and B2. It hydrates, soothes, and reinvigorates the skin, keeping it supple day and night. It also includes natural Bulgarian rose oil to soothe and hydrate. It's suitable for all skin types and it contains 100ml of product. It comes in a simple clean packaging - cream colored hard plastic container that also includes a spatula to get the product out in a hygienic way. You can also find the ingredient list at cosdna.com, so you can see which ingredient might irritate the skin. Only Algin and Alcohol Denat might irritate the skin, but Algin is at the very end of the list, which means the amount is small, so I wouldn't worry too much about it. Alcohol denat is in the mid-section of the list, but usually it's put into skincare products just because that it won't dissolve into oil or water so it will keep it together (there are many other reasons). Overall, I see a product with great ingredients. It's paraben-free, artificial color-free, artificial fragrance-free and has a mineral oil-free formula. Once you apply this on your face, you can directly feel the amazing cooling effect that it gives. It's so nice for the hot days! It has a light-gel texture, which is easy to spread. It just glides over the face and you don't need much product per usage. It does feels a tiny bit sticky after you've applied it, but that feeling goes away after a few seconds luckily. It leaves a matte finish while you can really feel that it's moist, it's like the moisture is locked into the skin. Unfortunately I don't have a moisturizer meter to check how much it increased (I wish I had one), but without it I can already feel that it's high lol. It has a very light floral scent to it, which smells surprisingly fresh as well. It's nothing overwhelming so I like it. I received this product from Honeysu.com, which is a brand new webshop in Belgium. I am always happy to see that there is an increase of European shops that offer Korean Beauty products. They also sell other products from Cremorlab, check out the assortment HERE. It makes it a lot easier for Europeans to purchase Korean beauty items, but shipping time would be a lot shorter as well! Honeysu sells products of Korean brands like Benton, Cremorlab obviously, Klairs, Missha and more! They provide free shipping to the EU, US and Canada if you purchase over €50.-. 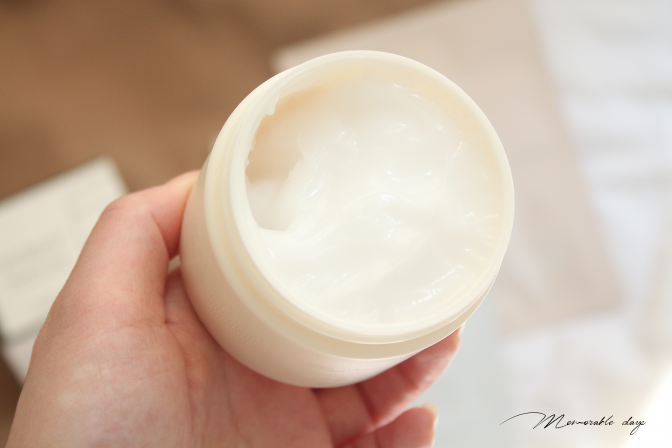 The Cremorlab Fresh Water Gel moisturizer feels lightweight and it's very moist. I have been using this product every single night for a while now. 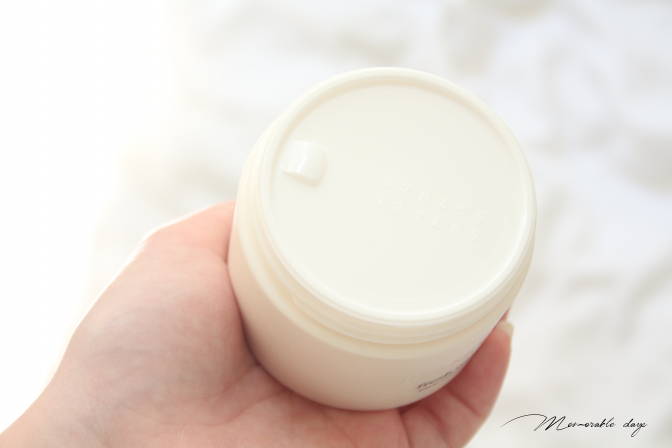 I have many night creams but I feel like grabbing this one over and over again recently just because it's moist and another thing: I absolutely LOVE LOVE LOVE the cooling effect of this moisturizer! I even put this in the fridge for extra cooling effect which is amazing for the hot days. I love how it calms my skin, just like a fresh water gel, it's very easy to spread, has a matte finish to it and has a fresh scent to it too. The name is very suitable for this product and it just does what it says. This product is definitely for you is you are looking for a moisturizer with a lovely cooling effect for the hot days. It includes great ingredients and suitable for all skin types. This product won't be for you, if you are looking for other benefits other than moisture. It locks the moist into the skin but it doesn't have any other visible benefits. I think that the Cremorlab Fresh Water Gel makes me think of the Laneige Sleeping Pack and Laneige Water Bank Eye Gel. Scent wise and finish is different but the texture is pretty similar and it has a lovely cooling effect as well, so if you like those Laneige products, you will most likely like this too! note: this product is send to me for review purposes, but this didn't affect my opinion about the products, see disclaimer.